Are you all set to leave your job? Write a resignation letter, because it is an important requirement to quit the job. It does not matter that you are quitting the job on good terms or not, but you have to properly write a resignation letter with its proper protocol. This is a formal goodbye and you have to write it in a formal tone. It will serve as an opportunity to build good relations with your employer while leaving the job on a positive note. A resignation letter should be written in a right style, and for your help, the resignation letter template is available. The sample template is designed by our experts with an official tone. 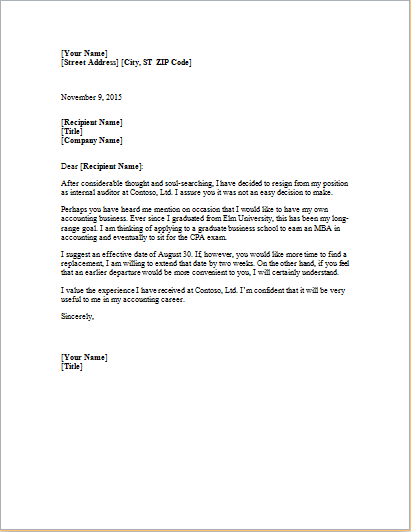 You can modify some details to write your own resignation letter. Always leave your previous job on a positive note, and a resignation letter is the best way to do this. You have to write your reason to quit the job and mention your experiences with the company. Say thanks to your boss and supervisor for their cooperation and all training you have attended during the job. Here is a resignation letter template to leave your job on good terms. It is based on a standard format, and you can modify it easily. You can share your positive moments with your colleagues, but do not make complaints, because it is not a right place for this purpose. Express your gratitude and desire to maintain good professional relations in future.